There are plenty of good news/bad news situations in Drop Dead Healthy: One Man's Humble Quest for Bodily Perfection. For the benefit of readers who might have thought about going on a 3-day fast or taking a pole-dancing class, irrepressible "experiential journalist" A.J. 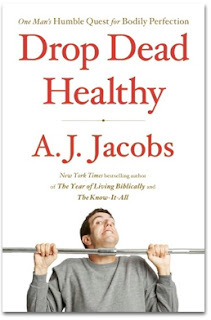 Jacobs has dedicated 26 months to exploring myriad ways to become the healthiest person possible. His efforts run from the usual (dietary changes, working out, etc) to flirtations with non-mainstream beliefs, including slow eating and the "Paleo movement," which requires exercising in the outdoors and having cave-dweller eating habits (lots o' meat, no grains). And, yes, he does take a pole-dancing class and go on a 3-day fast. The impressive time Jacobs devotes to research also shows how being better informed doesn't necessarily lead to better decisions because so many studies contradict one another. There's a dizzying amount of information available, and it's far from conclusive. The basics that he accepts, though, make sense: little to no white food (refined grains, potatoes), no mammals, eat less (choose smaller plates, don't eat while watching TV), more exercise and sleep, less stress. Oh, yeah, and get a pet (a dog, preferably). Floss regularly and wear noise-cancelling headphones too. Filtering my own daily habits through Jacobs' book, I found that as a soft core vegetarian (mostly vegetarian most of the time for decades, but also a consumer of cheese and yoghurt as well as fish now and then) who exercises regularly, I was doing okay. Except for one facet, that is. An early challenge in Jacobs' quest was to become less sedentary. He discovered that he sat—and we sit—far too much. For readers and writers (as well as most professions) there's a lot of sitting in the ordinary work day. And being a couch potato is a national pastime. According to Jacobs (and the researchers he cites) being sedentary is crazy bad for us, not least because it alters our metabolism and increases the risk of heart disease. What's more, the "desk is where most of the Crimes of Excessive Sedentary Behavior occur," Jacobs writes. He MacGyvers a "Treadesk," which is a treadmill with a secured platform on which to use his laptop. Over the course of his book he walks over 1,000 miles while writing. Sitting is bad news, but I noticed Jacobs doesn't say anything about laying. A treadmill will not fit into my apartment and there's no way I can write while pacing around...so I wonder about the Marcel Proust approach of writing from the recumbent position while in bed. Yes, laying is sedentary, but no, it's not sitting. Is that a loophole? Eating less sugar is a challenge, but sitting less seems Herculean. I'll probably wait to hear further research that proves how earlier research exaggerated the dangers, and continue to write and read while seated in a semi-slumped position.